Our organization is skilled to manufacture, supply and export a wide range of Solar Power Pack and Power Generation such as Solar Off Grid Power Plant and Solar Grid Tie Power System which are manufactured by our experienced engineers and workforce as per the international standards. Suitable to be used in any environment. Customers can avail them from us in a variety of sizes, colors and designs at affordable prices. Customized local solutions of power needs for industrial or distributed requirements. Build with in- house development that give best quality integration, durability with maintenance free operations. End to end solutions as well including government liaison. 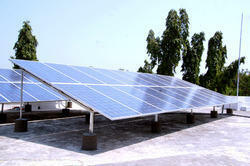 Looking for Solar Power Pack And Power Generation ?